In a few words: It is a selection of aromatic plants used to flavour a stock or a sauce. 1. Cut a portion out of the green part of the Leek that is about 10cm long. 2. 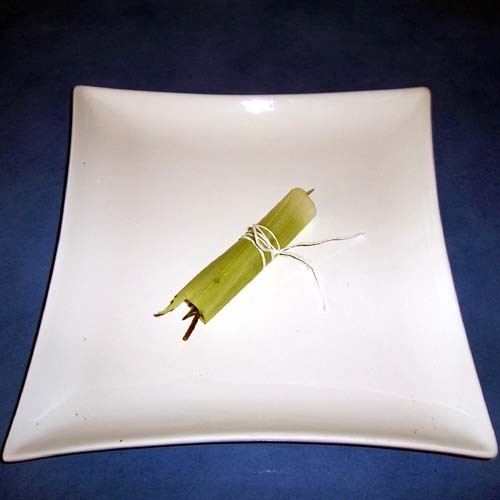 Next, cut the other ingredients into lenghts so that they are slightly shorter than the Leek. 3. Take one of the leaves from the 10cm section of Leek and place all of the other ingredients inside the leaf section. 4. Take a length of string and tie the leaf into a roll as shown. bouquet garni. Sometimes, they would also wrap it in a thin slice of bacon. Depending on the type of food, you may like to obtain different type of flavour. There are a few variations to the “traditional” bouquet garni. Beef: Orange Zest, rosemary, thyme and parsley. Fish & Shellfish: Lemon zest, tarragon, and dill. Lamb: Rosemary, mint, thyme, parsley. Pork: Sage, thyme and marjoram. Poultry: Celery, parsley, thyme, marjoram, tarragon and bay leave. *for game birds- add some juniper berries in a muslin bag. Vegetables & Pulses: bay leave, oregano, parsley, sage, marjoram. TIP: For easy removal of the bouquet garni at the end of the cooking, leave a long end on the string that you can tie to the handle of the pan.